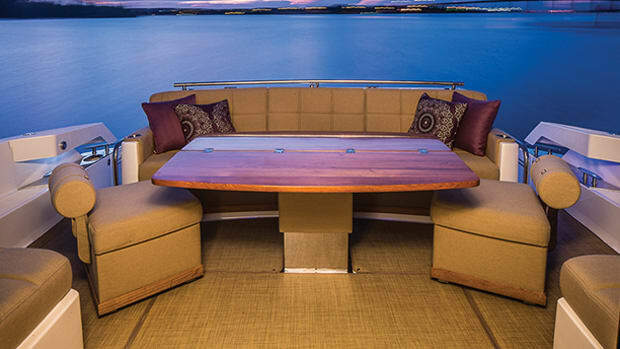 Modern marine fabrics are about as different from traditional canvas as a Feadship is from a wooden dory. 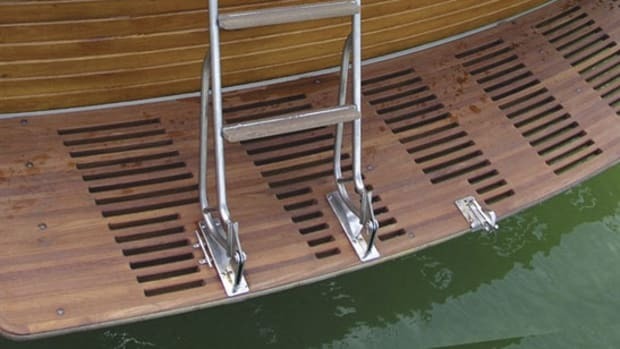 But which one is right for your boat? Herculite’s Regatta is a heavier vinyl-impregnated fabric that’s excellent for laceless tops. This time of year, folks in many parts of the country need more than a sheet of canvas to protect them from the elements, but if past experience holds true, warm weather will eventually return. When it does, will your canvas be ready, or is your bimini top, or enclosure, or cockpit cover, or all of the above, getting a bit long in the tooth? Now is a good time to make sure you have nice, fresh, clean, tight-fitting canvas when springtime arrives. Until the development of modern textiles about 50 years ago, boat canvas was made of cotton. It weighed a ton compared to modern fabrics, especially when wet. It shrank and stretched as its moisture content changed—side curtains that fit like gloves when dry couldn’t be stretched to catch the final fastener when wet. It had an amazing propensity for growing mold and, under the summer sun, colored canvas faded almost while you watched—most people chose white, or tan, or maybe a pale, sickly green. Even with the best of care canvas lasted only a few seasons before needing repair. 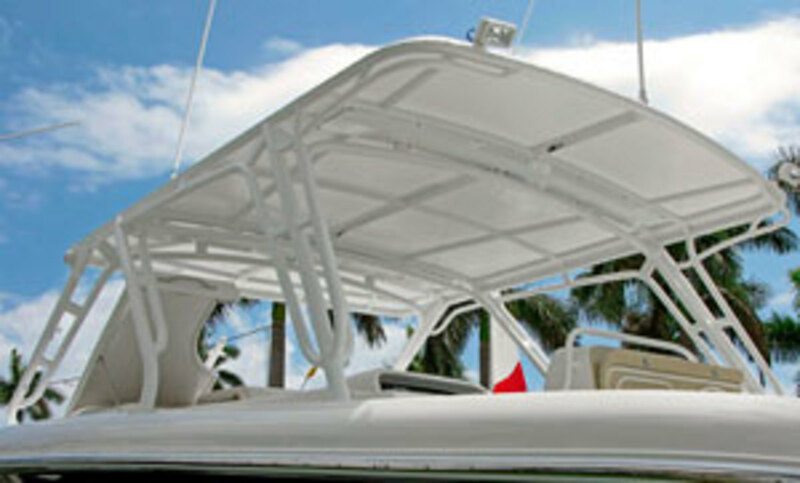 Today’s marine canvas is lightweight, dimensionally stable wet or dry, colorfast, and mildew resistant. It’s about as far removed from cotton canvas as you can get. 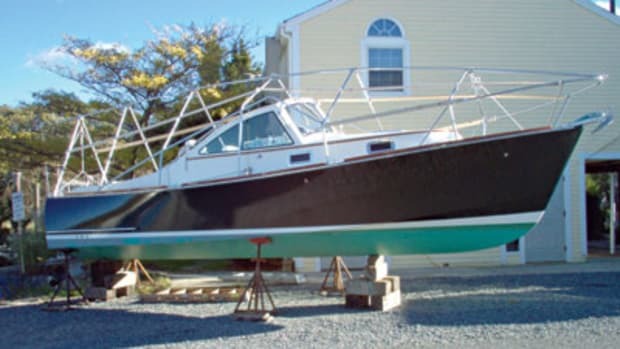 It’s also very long-lived, so when you invest in new canvas for your boat, choose carefully because it’ll be your shipmate for years, maybe a decade or more. And choosing it is more complicated than you might think, since you’ll have to pick from acrylic, polyester, vinyl-coated, or space-age polymer fabrics. Some are waterproof, others “breathe.” Some come in about a thousand colors, others are offered in shades of white. Some demand more expertise from the canvas maker and some forgive slight errors. So which is best for you? Sunbrella is a tough, mainstream acrylic. 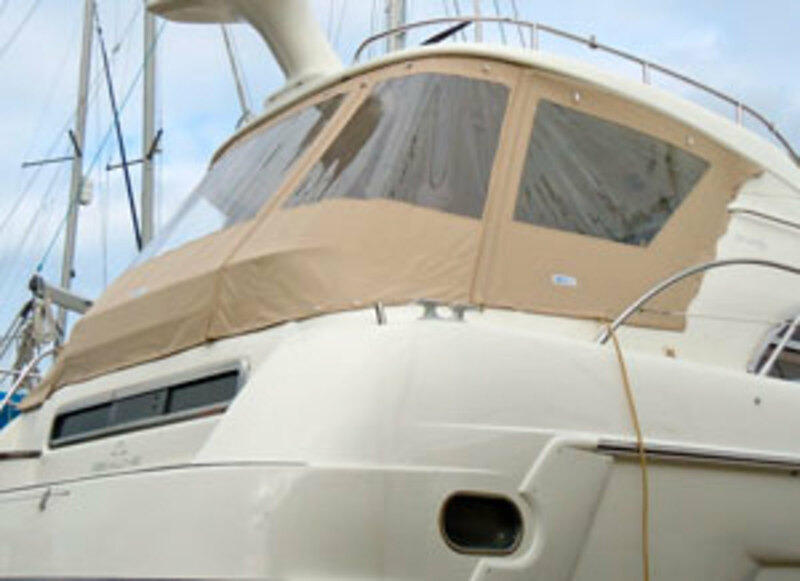 Acrylic is the most popular fabric for marine canvas today. Sunbrella (www.glenraven.com), from Glen Raven, Inc., in North Carolina, is the elephant in the acrylics room, although there are other excellent brands, such as Recacril (www.recasensusa.com) and Outdura (www.sattler-ag.com). Make sure the acrylic you choose is “solution-dyed,” meaning the color was added while the acrylic was still liquid, before the fibers were extruded; the color therefore becomes an integral part of the fabric, and will stay bright for years. Acrylics are long lasting, come in an almost endless array of colors, feel like natural fabrics, and breathe, so ventilation isn’t an issue. They are water-resistant, thanks to a fluorocarbon surface coating, but not waterproof. The coating needs renewal periodically: Glen Raven, for example, recommends applying 303 High Tech Fabric Guard every five years, or after every “thorough” cleaning; in Sunbrella speak, a thorough cleaning means 15 minutes of soaking in a bleach/detergent/water solution. 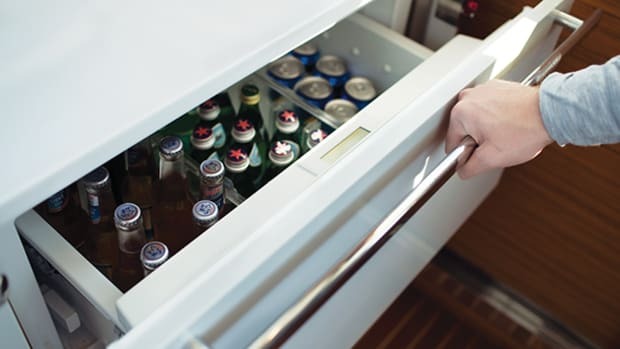 Normal cleaning requires only a mild detergent, using a diluted bleach/detergent cocktail to spot-clean stains. Acrylics are great for colored canvas, but if you want white maybe vinyl will work better for you—it’s more stain-resistant and easier to clean. 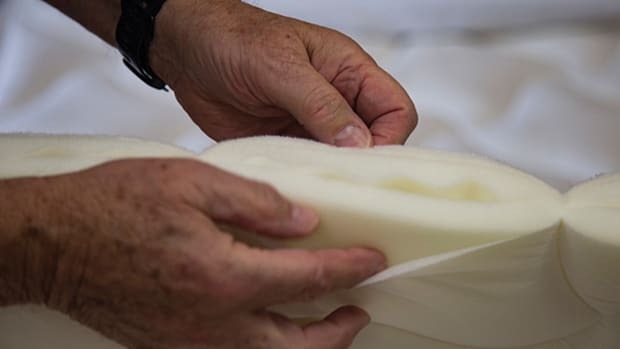 “Dirt, debris, and engine fumes remain on the surface of the fabric because there are no fibers to infiltrate and imbed,” said Craig Zola of Herculite (www.herculite.com), the York, Pennsylvania-based manufacturer of Regatta and Riviera materials; each is available in three shades of white. Stamoid (en.sergeferrari.com), another popular vinyl, is manufactured in France but sold by many distributors in the U.S. It also comes in an “extensive palette of subtle whites,” according to the Web site. Herculite’s Regatta is built on a thicker polyester scrim than Riviera, said Zola, which makes it stronger and heavier. “It’s perfect for lace-on flying-bridge tops and curtains,” he added. Regatta also comes in a “Duplex” version with a white top and colored underside, with a choice of light blue, light green, or light gray. Riviera, on the other hand, is softer, with a “supple hand.” It has excellent resistance to cold cracking, tearing, weathering, rot, ultraviolet rays, and seagull droppings, said Zola. Both fabrics, like all vinyls, are waterproof, but the downside is they don’t breathe, so in some instances—enclosures or tight-fitting covers, for instance—a provision for ventilation is required. Most “vinyl” fabrics are actually comprised of a polyester scrim with PVC laminated to it. The PVC or vinyl makes the fabric waterproof, while the polyester scrim is stronger than acrylic and stretch-resistant. Strength isn’t usually an issue with canvas—it’s not intended to be structural—but stretch is a factor: Woven fabrics stretch, especially on the bias, so canvas fabricators, just like dressmakers and other textile craftspeople, arrange the fabric to minimize stretch, and/or cut the pieces of enclosures and other items to allow for it. 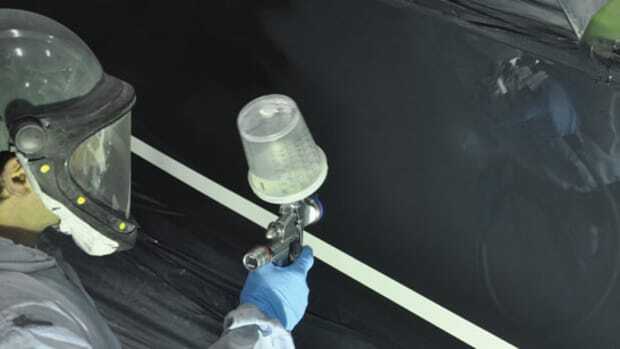 Working with vinyls and other stable fabrics requires a bit more precision, said Zola. WeatherMax is a new, high-tech polymer that’s stronger than either acrylic or polyester. But maybe you want something a little more cutting-edge? Here are two very modern fabrics based on high-tech polymers, both from Safety Components, Inc. (www.safetycomponents.com) in Greenville, South Carolina. 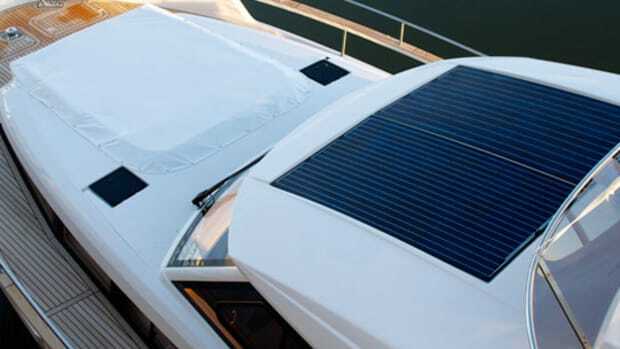 BreakWater X, recommended for lace-on and permanent tops and enclosures, marries a “high tenacity” fabric with a specially formulated PVC-based vinyl “alloy.” PVC is a naturally hard polymer, explained a company spokesperson, but for use with fabric it has to be made soft. That’s usually done with plasticizers, which can leach out over time; Safety Components “alloys” PVC with another, naturally soft polymer that won’t leach out, so the vinyl stays flexible. The result? BreakWater X is stronger and more tear resistant than polyester-based vinyl fabrics, according to the manufacturer, and it’s more long lasting: It’s covered by a 10-year warranty. 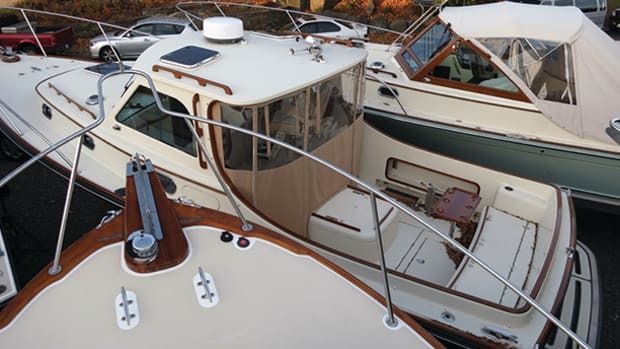 BreakWater X won an IBEX Innovation Award for Boatbuilding Materials and Methods in 2013, chosen by a panel of experts overseen by the National Marine Manufacturers Association. BreakWater X shares a downside of other vinyls—limited colors, all of them a shade of white. But Safety Components also makes WeatherMax, combining a newly engineered woven-polymer fabric with the company’s HydroMax finish to make it stretch- and water-resistant. WeatherMax is stronger than either polyester or acrylic, and available in a wide range of solution-dyed colors, which the company claims are almost as fade-resistant as acrylics. 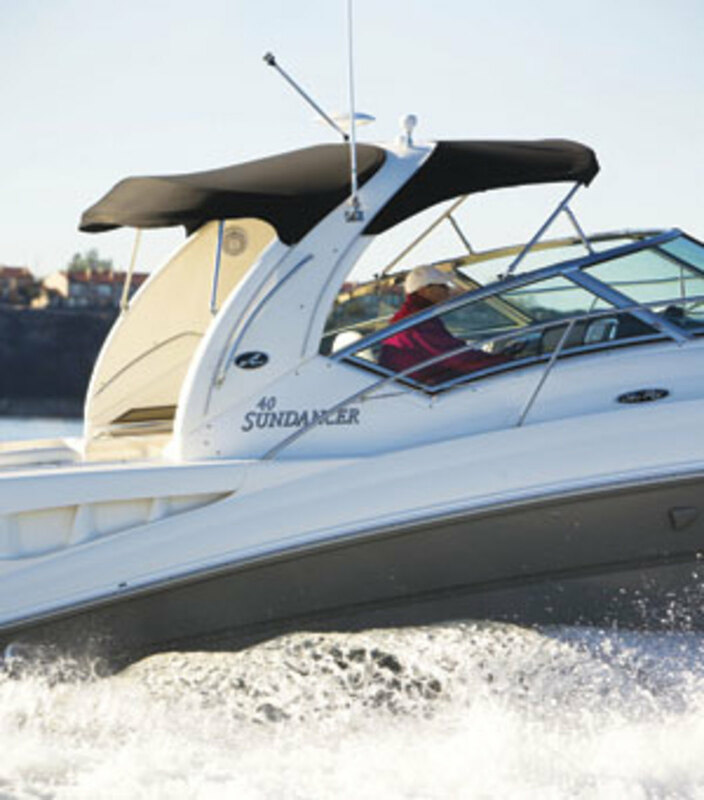 A variation of the fabric, WeatherMax FR, is flame retardant as well, not a bad idea for a boat when you think about it. The WeatherMax polymer is based on polyester, but has better UV resistance and strength retention as it ages, thanks to the magic of chemistry: Oxygen in polyester’s molecular chain breaks free and oxidizes over time, undermining the properties of the material. To prevent this, Safety Components chemists altered polyester’s molecular chain to improve the stability of the oxygen bonds, thereby creating a new polymer. Safety Components was awarded a Canadian patent on WeatherMax in July of 2013; the U.S. patent application is still pending. The above is just a sample of all the marine fabrics on the market; there are many more, most of them just fine for their intended use. What’s most important is to pick the fabric that matches your needs, whether it’s bright color, ease of cleaning, durability, warranty, or whatever. But unlike the old days, when it wasn’t too important if you didn’t like your canvas because you’d be replacing it soon anyway, today you’d better like what you choose: You’ll be living with it for a long time. This article originally appeared in the January 2014 issue of Power & Motoryacht magazine.